Brian Davies wrote to tell us about the Bald Eagles on Scotland Road ..... February 18 , 2014 at 11:38 am, out across from the dump I was looking for the Red Tail Hawks that live in the trees. I came across an adult Bald Eagle in the air and a Juvenile perched in the tree, these two I had seen there the week before. Got pictures of both but not really close. Will try again hopefully soon, it was the highlight of my bird watching day! 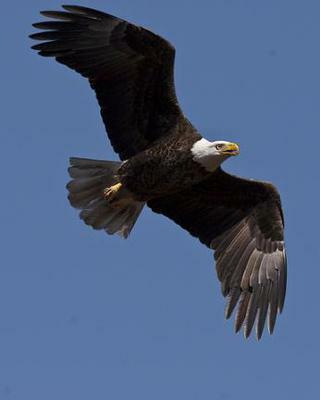 Bill from London, Ontario wrote to say ..... February 22 2014 at around 4:50 pm - I was driving home in north London, when I noticed a large bird flying overhead with the markings of a Bald Eagle (white tail and head). So neat to see .....since I don't think I have ever seen one in this city in my life. What a spectacular sight. Just before this sighting in the North east end of London I noticed an eagle's nest atop of a utility line tower. A reader from Dorchester, Ontario, sent us this report ..... Today, March 18, 2014 at about 2:00 pm, I saw a Bald Eagle traveling away from the Thames River in Dorchester. The eagle soared in small circles moving away from the river gradually at a height not very much more than double tree height. It is a sunny and mild day at 2C. I was driving over the Dorchester bridge crossing the Thames River, we observed a Bald Eagle soaring along the river heading west - what a beautiful sight! I live in the 4300 block of Hamilton Road (south side) and watch a Bald Eagle out my window frequently, and have been seeing it for the 3 years I've been living here. I have also seen Bald Eagles in this area - we live just outside of St Thomas and yesterday, March 27th 2014, at around 9:15 in the morning, I observed one flying quite low around a farmer's field, just north of the intersection of highway 3 and Wellington Road, St Thomas. It had a white head and tail, and a dark body, and was unmistakable - even though I wasn't close enough to get a good picture, the head and tail showed up really well whenever the bird turned and the sun shone on it - it was definitely a Bald!